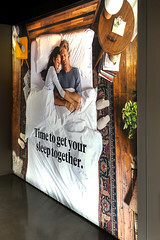 Modern Brands and Retailers love SEG Tension Fabric Signage, especially in Times Square, where it’s easy to get noticed. 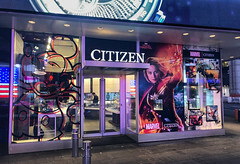 We recently printed and installed a new SEG Tension Fabric window display for the Citizen Watch Flagship Store at Times Square in New York City. For the project we produced (2) Double-Sided SEG Tension Fabric Frames with printed graphics. 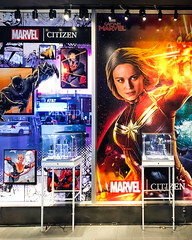 The frames were hung from the ceiling in the front window of the store where shoppers can see the graphics from the street. 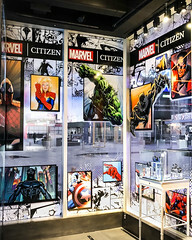 Surrounding the displays are Ultra Clear Cling of light bursts that we applied to the window glass. The overall presentation highlights the watches ability to be powered by any light. Times Square in New York City is known for its abundance of signage imagery. Everywhere you look there are images trying to grab your attention. SEG fabric is definitely playing a part in that. 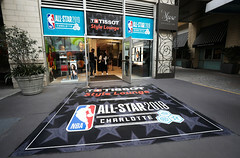 This product is being used by many major brands and retailers as a primary form of retail signage. 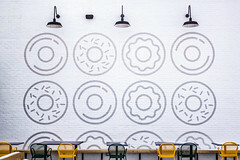 Ceiling Hanging SEG Fabric Graphics are very popular in store windows. 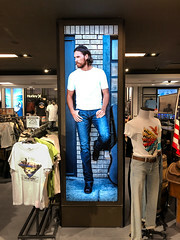 If you are interested in learning more about how retailers are using SEG Fabric and Frames please give us a shout at 800-962-3119 or click the link below to be contacted.